Capture the eclectic spirit of Argentina on this 6-day tour departing from Buenos Aires. After a comprehensive tour of the capital city, venture south to El Calafate in Patagonia. Between the urban landmarks of Buenos Aires and the natural splendor of the countryside, you'll walk away with a better understanding of this vibrant country. Breakfasts are included at your nightly accommodations; dinner is on your own during evening free time. Lunch location and timing is dependent on the day's activities. Please see Itinerary section below for full details of the daily activities. Upon your arrival at Ezeiza International Airport in Buenos Aires, you’ll be transported by a professional driver to your hotel. After check-in, the rest of the day is yours to relax and explore the city on your own. After breakfast, head out for a guided 3-hour city tour. Visit popular Buenos Aires attractions like the Obelisk monument, Plaza de Mayo, Plaza San Martín and Plaza Congreso. As your guide gives you historical and cultural information about the city, explore the city’s best-known neighborhoods: La Boca, known for its colorful buildings; San Telmo, where a walk down its cobblestone streets will make you feel like you’ve gone back in time; Palermo, one of Buenos Aires’ largest neighborhoods; and Recoleta, home to impressive architecture. Then head over to Lezama and Tres de Febrero, two of Buenos Aires’ many beautiful parks. After your tour, you’ll be taken back to the hotel and have free time to go out to lunch and relax before enjoying a night of authentic Argentine cuisine and tango! You’ll be driven to Café de los Angelitos, where a delicious 3-course Argentine meal awaits you. After dinner, sit back and be dazzled as some of Argentina’s best tango dancers perform. After the show, you’ll be transported back to your hotel. After breakfast, head out on a full-day guided excursion to Los Glacaiers National Park. Learn about the natural features and wildlife of the park from your knowledgeable guide as you walk along hiking trails to see Perito Moreno Glacier. Standing more than 262 feet (80 meters) tall, Perito Moreno is a spectacular natural beauty. You’ll also have time to explore other parts of the park to admire impressive natural features like craggy Mt Fitz Roy, Cerro Torre, Lake Argentino, Lake Viedma, Upsala Glacier and Spegazzini Glacier. When you return to your hotel, the evening is yours to do as you wish. After breakfast, you’ll be transported to Ezeiza International Airport for your departing flight. 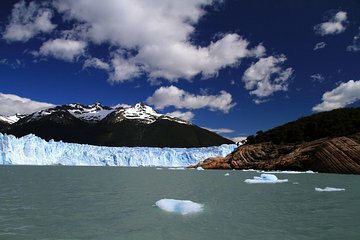 The concept behind this tour is great - an overview of Buenos Aires, including a tango show, plus a trip to Calafate to see the amazing Perito Moreno Glacier. Almost all the sites and activities were wonderful. BUT, my husband and I experienced a number of serious problems with the tour, all of which stemmed from the main operator. First, they booked one of our Buenos Aires' hotel rooms on the wrong night. I found this out when I contacted the hotel directly to confirm. Second, they repeatedly failed to provide us with even the most basic info. We kept having to email their offices, which are not open 24/7, to find out what time we would be picked up, etc. For airport pick-ups, we ended up just trusting that someone would be there. For our tango show, after our requesting it, we were told when we would be picked up - but we literally got into the van having no idea where we were going. After getting frustrated with the daily hassle of requesting times, we asked them to send us an itinerary. We got a handwritten one, probably more than halfway through the trip. Fortunately, in Calafate, they turned us over to a travel agency. The agency folks were fantastic. We were given a schedule and vouchers, plus a full explanation of our time in Calafate immediately upon arrival. They agency was the exact opposite of the tour operator. The only problem - I blame this too on the tour operator - was that we were not able to do glacier trekking because slots for that were full. The tour operator should have informed us of these options or directed us to the local agency in advance. Other notes: The Buenos Aires bus tour was LARGE group, and not very good. Good thing my hubbie and I speak Spanish b/c the tour guide did not speak much Eng. Tango show/dinner was amazing. WARNING: This tour notes that airfare to Calafate is not included, but it doesn't do so prominently. You will have to buy your own tix, but the extra cost was worth it.